Discussion in 'Quotes Debunked' started by Mick West, Aug 9, 2014. Most large scale conspiracy theories share a belief that the world elite are planning some kind of massive and rapid depopulation. A common technique amongst those who seek to promote this fear is to take quotes entirely out of context, and make them seem the opposite of what the speaker actually meant. 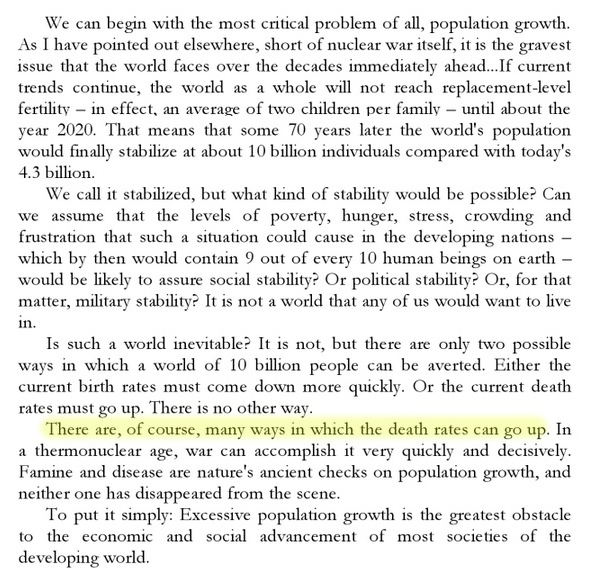 Considering he thinks that nuclear war is a worse problem than excessive population, he can hardly be suggesting nuclear war is a good idea. No, what he's saying is needed is a reduction in the birth rate, so we can avoid the alternative. The quote seems to be an excerpt from a speech he gave many time. This longer article also makes his position very clear.